Silvio Moser, one of the few swiss drivers who made it into F1 in the 60s. here's his Cooper ATS for the Volker Holz Cooper. not sur if anyone's still using that coop, though. 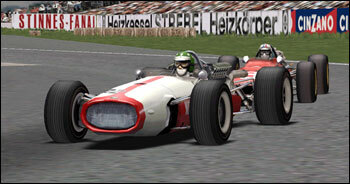 biker_jim_uk has updated this skin to fit the GPLEA Cooper, newer versions are available from Luc Van Gossum and POLDO. search the RSC GPL addons forum or visit Van Gossum's site.